I decided to make a turkey bento earlier this year since I usually tried to come up with one at the last minute in past years. Nikolai was born on Thanksgiving Day almost 9 years ago so his birthday always falls around the Thanksgiving holiday. Naturally we are always so busy with parties preparation at that time, the making of a festive turkey bento is left at the back burner. I was unable to find my turkey shaped cookie cutter but remembered an idea I saw on pinterest using a hand shaped cookie cutter for a turkey! Here is what I came up with. Turkey shaped sandwich (cut using a hand shaped cookie cutter), sweet peppers for feather (free hand cut), icing eyes, sweet red pepper wattle, yellow sweet pepper beak and cheddar feet. Cucumber slices with a turkey cupcake pick. Seedless red grapes and strawberries. This lunch is packed in an Easylunchboxes container. Linked to Bento Blog Network. I love your turkey sandwich! Also clever use of bugles, they look like mini cornucopias. What a cute lunch! I love the idea! This is such a cool idea! So creative! gosh....very creative and I love it! 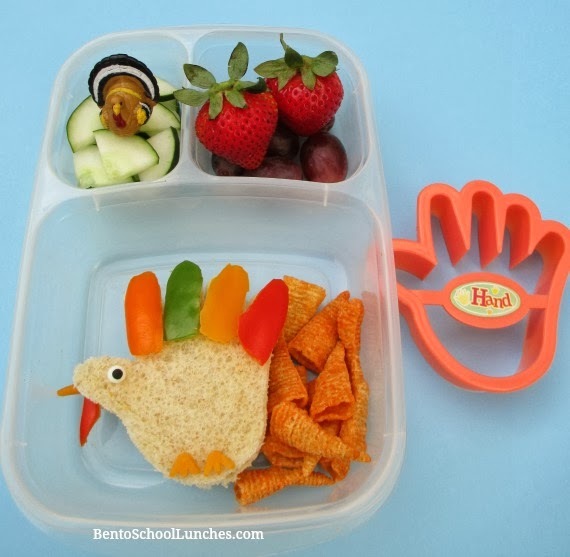 What a clever way to use the hand cookie cutter! Very cute!